William Morrow & Company, 9780688154486, 352pp. But the family almost rides its principles into the ground. "Nobody will ever choose a beer on the basis of a thirty-second ad," Bill Coors is fond of saying at a time when his two main competitors, Anheuser-Busch and Miller, are spending upward of a billion dollars a year on ads. He won't even allow a ring-pull can. The brewery's decline and recovery are dizzying. But Citizen Coors is more than a business story. Here is Adolph, the founder, in 1929, distraught over Prohibition, hurling himself to his death from a hotel balcony. Here is Bill, ten years later, yearning for the wider world but forced back to the brewery by a single glance from his father. Here is Joe, Jr., raised to rule yet suddenly banished for marrying without permission. Here is Peter, prevented from rescuing the company precisely because he has been trained to do so. Here is kidnapping and murder. Here are generations of Coors men broken against the iron will of their fathers. Here is a second suicide, eerily similar to the first. Based on more than 150 interviews, Citizen Coors serves up a powerful cocktail of beer and politics. Dan Baum, a former reporter for the Wall Street Journal, captures in this rollicking narrative the genius, eccentricity, and tragic weaknesses of the remarkable Coors family. With enough private dramas to put them on par with the Ewings of Dallas, and enough business crises to keep them constantly in the business hot-seat, the ultra-right-wing Coors of Golden, Colorado, represent one of the more riveting family sagas of our time. Their billion-dollar empire grew out of a single brewery begun in 1873, but it wasn't long before the family became known as much for their right-wing politics as their beer. 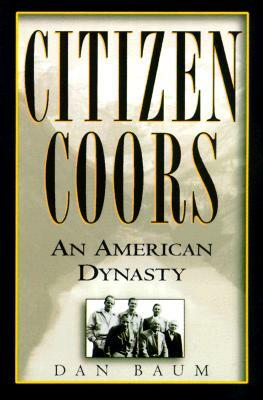 The third generation of Coors men financed the birth of the Heritage Foundation, which jump-started the Reagan revolution. Old-fashioned about business and equally dubious of new ideas, they consistently ignored the importance of marketing until they were forced to, finally introducing the "Silver Bullet," and improved their image with unions and minorities only after they were compelled to do so by years of boycotts. Former Wall Street Journal reporter Dan Baum captures the eccentricity and foibles of this family and company in this fast-paced tale of vivid characters in business and politics.With enough private dramas to put them on par with the Ewings of Dallas, and enough business crises to keep them constantly in the business hot-seat, the ultra-right-wing Coors of Golden, Colorado, represent one of the more riveting family sagas of our time. Their billion-dollar empire grew out of a single brewery begun in 1873, but it wasn't long before the family became known as much for their right-wing politics as their beer.